This might be the most important report written in 2016 and perhaps in this century. In my simple understanding of things global warming, it seems that any honest scientist that reads this must be able to show this report to be wrong or, if not already, join us as a skeptic. By zeroing out natural causes, this report shows why man-made CO2 does not have a statistically significant impact on global warming. It validates other studies, especially ice cores,that show that CO2 is a lagging variable, not a leading variable. Some background. The damage to the US economy caused by the EPA claiming that CO2 emissions will eventually lead to catastrophic increases in Global temperatures was first permitted as a result of the US Supreme Court telling the EPA to determine if CO2 was hazardous. So if the EPA could make an endangerment determination, then the Court would allow CO2 (and several other minor greenhouse gases) be added to the Clean Air Act (CAA). CO2 was considered in detail by Congress when they passed the CAA and Congress rejected its inclusion. Once again the Supreme Court, fully aware of Congress’ rejection, decided to legislate –not their prerogative– by including CO2 if the EPA said it was hazardous. Second, higher atmospheric CO2 and other GHGs concentrations are claimed to have been the primary cause of the claimed record setting GAST over the past 50 plus years. Third, the THS assumption is imbedded in all of the climate models that EPA still relies upon in its policy analysis supporting, for example, its Clean Power Plan–recently put on hold by a Supreme Court Stay. These climate models are also critical to EPA’s Social Cost of Carbon estimates used to justify a multitude of regulations across many U.S. Government agencies. The scientists that issued the report: On the Existence of a “Tropical Hot Spot “& The Validity of EPA’s CO2 Endangerment Finding” have set out in detail their methodology and data used to arrive at their conclusions. These can be examined by clicking on the link above. In summary, the scientists looked at natural causes for increases and decreases in global temperature as well as man-made causes. CO2 produced by burning of fossil fuels is a man-made source. There were three natural factors—an increase or decrease in Solar radiation, volcanic activity, and ENSO (El NINO Southern Oscillation) . Natural factors can not be the result of human actions. Obviously, fossil fuel produced CO2 is not a issue here. These scientists removed from 13 temperature records the effect of natural causes of temperature changes leaving only the man-made causes. The temperature records were from balloons, satellite, ground and ocean temperature readings. “These analysis results would appear to leave very, very little doubt that EPA’s claim of a Tropical Hot Spot, caused by rising atmospheric CO2 levels, simply does not exist in the real world. Also critically important, even on an all-other things-equal basis, this analysis failed to find that the steadily rising Atmospheric CO2 Concentrations have had a statistically significant impact on any of the 13 temperature time series analyzed. Thus, the analysis results invalidate each of the Three Lines of Evidence in the EPA’s CO2 Endangerment Finding. Once EPA’s THS assumption is invalidated, it is obvious why the climate models they claim can be relied upon, are also invalid. And, these results clearly demonstrate–13 times in fact–that once just the ENSO impacts on temperature data are accounted for, there is no “record setting” warming to be concerned about. In fact, there is no ENSO-Adjusted Warming at all. These natural ENSO impacts involve both changes in solar activity and the 1977 Pacific Shift. Moreover, on an all-other-things-equal basis, there is no statistically valid proof that past increases in Atmospheric CO2 Concentrations have caused the officially reported rising, even claimed record setting temperatures. To validate their (critic’s) claim will require mathematically credible, publically available, simultaneous equation parameter estimation work. Where is it? I reviewed a website that had discussed these findings that there is no significant statistical evidence of CO2 causing global warming. Not a single challenge using data and facts. All of critics were saying that “97%” could not be wrong or using ad hominem attacks on the author. So as the authors of the report say about having a factual disagreement, “Where is it? What does that mean? There are two factors that make H2 non-competitive versus other alternatives. 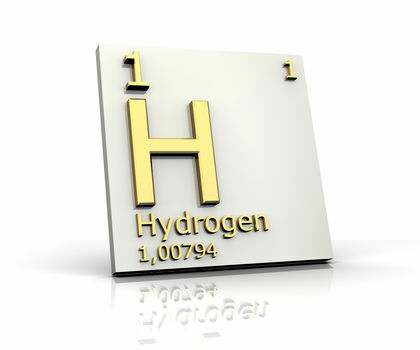 Factor one is that hydrogen (H2) is very costly to produce, and distribute. The second are the physical characteristics of H2 that increase the cost of distribution and use. Like the tide, going in and out and so does the Fuel Cell Vehicle favorability. Right now favorability is pretty well in the tank, but not completely. The city of London is installing hydrogen (H2) fueling stations with the objective of encouraging their use. California has a similar program, as does Germany. Some of you may not be familiar with fuel cell cars because they have been out of the spotlight recently. 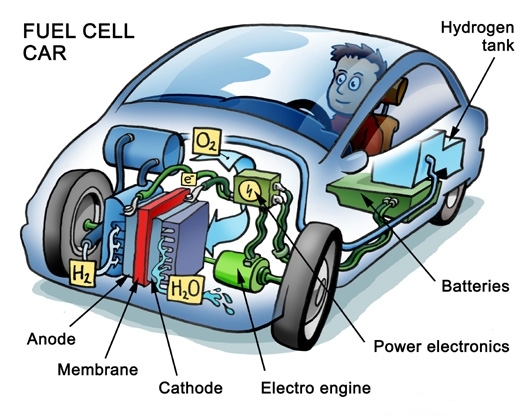 The following is an overview of the fuel cell and the fuel cell car. The cartoon below pictures most of the hardware needed. In 2012 the Governor of the State of Delaware, Jack Markel, entered into a long-term contract with Bloom Energy. The contract obligated Bloom to begin manufacturing their “Bloom Boxes” in the closed Chrysler Assembly plant. Delaware was obligated to subsidize Bloom to the tune of the difference of the cost of the electricity produced by Bloom Boxes and the cost of open market electricity. That subsidy rose from $0.67 in October 2012 to $3.83 for September 2013, a 570% increase, where it increases each ratepayers month’s bill. Delaware has mandated a requirement to buy renewable energy produced electricity that grows to 25% of the total energy used in the State by 2025. The open market electricity price has been dropping due to the increased availability of natural gas from fracking operations around the Nation. The natural gas is becoming the major source of energy for producing electricity. Natural gas is not considered a “renewable” form of energy. But the State passed an exception to their renewable energy law that allows Bloom Box energy to be called “renewable” even though these boxes use natural gas as their energy source. The irony here is that the electricity produced using natural gas the standard way, the electricity is much less expensive than electricity produced by Bloom Boxes. But remember, the State has a law that demands the use of “renewable” energy produced electricity.